Together ~ we are in this together. The education of a child is not just left to the parent, nor the teacher. The home, school and parish all assist in raising the whole child- together. We value parent engagement and support at our school. Peacemakers ~ is our motto. 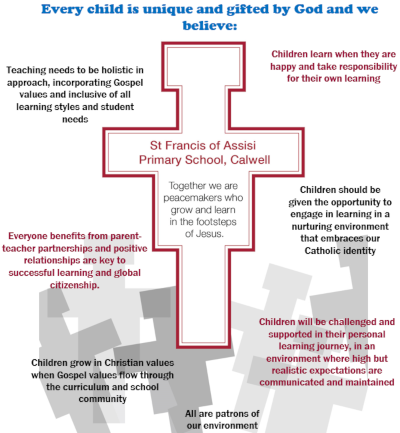 Our school draws on the vision of St Francis of Assisi who was a ‘peacemaker’ for all. St. Francis was a man of peace. In everything he did, he constantly sought to create peace between people, families, and cities. Grow and learn~ Teaching and learning is our core business. With joy, love and respect, we want our students to grow and learn as resilient people, who will continually develop the knowledge and skills to meet challenges, see opportunities and actively engage in an ever-changing world. Footsteps ~ Our school logo is based on the San Damiano Cross, the cross that is hung in the Basilica of St Clare in Assisi, Italy. It spoke to St Francis of Assisi in 1212AD. Our logo contains cobblestones that include symbols of community members and symbolises steps on the journey of primary education. We believe we are on a journey and our role is to support all community members on this journey. Jesus ~ As a Catholic School, we believe that Jesus is central to our lives. In our school, we follow the life of Jesus and aim to develop a relationship with Him - the example of His life, His ministry of teaching, His healing and the Good News He shared. Catholic Care provides the school with the services of a Counsellor on a regular basis (at least one day per week). The role of the Counsellor is to be available to parents, students and teachers who seek some sort of advice or assistance with academic, social or behavioural matters. Parents may request an interview with the Counsellor. If teachers wish to refer a student to the Counsellor, parents are contacted and permission sought, prior to the Counsellor seeing the student. Please contact the Front Office to make an appointment to speak with the Counsellor. The St Francis of Assisi Primary Learning Support Team includes our Learning Support Teachers, Reading Recovery Teachers, Numeracy Intervention Program Teacher and Learning Support Assistants. The aim of the Learning Support program at St Francis of Assisi Primary is to support and encourage those children in the school whom, for a variety of reasons are referred by the classroom teacher or are assessed as Students with a Disability. The Learning Support team assists the classroom teacher to support students with their development with in-class support, small group support and individual withdrawal support. Trained volunteers from our parent and parish communities also provide valuable assistance in the classroom with Guided Reading, Literacy, Maths and Gross Motor. Our older students are also trained as Peer Tutors for the younger students in the school assisting with listening to reading and supporting their peers with reading strategies. The St Francis of Assisi Canteen aims to provide healthy food for our children. The canteen has implemented the 'Fresh Taste NSW Healthy School Canteen Strategies Policy' that the Archdiocese of Canberra Goulburn has adopted. The canteen is open Monday to Friday except for Tuesday. Children can purchase a variety of healthy and tasty snacks at recess and lunch. Parent assistance is always required in the canteen especially at recess(11.00am) and lunch(1.00pm) and parents are asked to help out when able. All lunch orders must be placed using the Qkr! App available to download to your smart phone. your child's order written on the front of the bag. Homework is a method of communication between home and school. It enables you to become aware of the learning process and to monitor your child's progress. Some classes use a weekly contract while others use a nightly homework activity. In addition, reading and listening to stories is strongly encouraged. It is recommended that homework be consistent across each year level and be progressive from one year to the next. Upon completion of homework a parent's signature is required and the work is then returned to school for correction. If students are experiencing difficulty with homework parents are urged to make contact with the class teacher. St Francis of Assisi was a man of peace, who constantly sought to create harmony and unity in everything that he did. Our school draws on the vision of St Francis as we strive to be peacemakers. Our school logo is based on the San Damiano Cross that hung in the Basilica of St Clare in Assisi, Italy, and spoke to St Francis in 1212AD. Our logo contains the cobblestones symbolic of our community members and the steps on our educational, supportive journey. Our school began in 1988 and was founded by the St Francis of Assisi Parish Community and the Good Samaritan Sisters. It is situated around the oldest Catholic Church in the ACT, the Sacred Heart Church, which was built in 1902. From the beginning, the emphasis has been on community - family, parish and school - being the place of peacemaking, and in the words of the Parish motto: - "to support and be supported". During the first year, it was on site at Holy Family School, Gowrie while the first stage of building was completed at Calwell. The school continued to grow, being built in stages until the final stage was completed in 1992. In 1994, a second Catholic primary school, St Clare of Assisi, commenced within our Parish to accommodate the increasing Catholic population of the Tuggeranong Valley. St Clare of Assisi draws on the suburbs of Bonython, Gordon, Conder and Banks for its enrolment, while St Francis of Assisi continues to draw on Richardson, Isabella Plains, Calwell, Theodore and rural surrounds. In 2005, we became part of the newly formed Corpus Christi Parish, which was formed following the amalgamation of the Holy Family Parish, Gowrie and our St Francis of Assisi Parish, Calwell. St Francis of Assisi accommodates three classes in each Year Level from Kindergarten through to Year 6, with the exception of Kindergarten, which consists of two classes. The school currently has an enrolment of approximately 460 children and is administered by a Leadership Team including the Principal, Assistant Principal, Religious Education Coordinator and two Primary Coordinators. The Parish Team and the School Community Council support the Leadership Team. Almost 40 full-time and part-time staff including Teachers, Teacher Librarian, Specialist Teachers, Learning Support Teacher, Learning Support Assistants, Secretary, Bursar and other associated support staff all work diligently to support the students and families of the school community.